Rajasthan, the biggest state of India and commonly well known for land of king or land of monuments. Due to there are a several magnificent monuments to visit in this regal and majestic Indian state. Monuments are backbone of Rajasthan Tourism and attract tourists through all over the world. Here is short information concerning top five precious monuments (forts & palaces) to see during Traveling India. 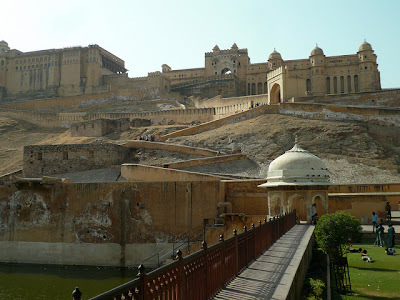 Amber Fort is located in the Jaipur, the capital of Rajasthan. Jaipur is also known as a pink city. The structure which is known today as Amber Fort was initially a palace complex within the original fort of Amber that is today known as Jaigarh Fort. The ancient Amber Fort is one of the most sought after monuments in the state. It is located on a hill and its wonderful architecture which is combination of both Hindu and Mughal architectural styles. The fort complex houses built with red sandstone and marble consisting of the Diwan-e-Aam, Diwan-e-Khas, Sheesh Mahal, Jai Mandir, Sukh Niwas, etc. Kumbhalgarh fort is located at Rajsamand district in Rajasthan. The huge gate of Kumbhalgarh fort is called the Ram Pole or Ram Gate and this gate was built by Rana Kumbha during 15th century to 19th century on impregnable hill. Kumbhalgarh is the also famous for birthplace of Maharana Pratap. This magnificent fort is open for tourists as a museum and houses many beautiful structures inside. The fortress is surrounded by giant walls which extended over 36 km. 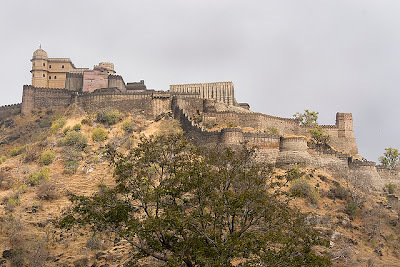 The Kumbhalgarh Wall is the second-largest continuous wall after the Great Wall of China. 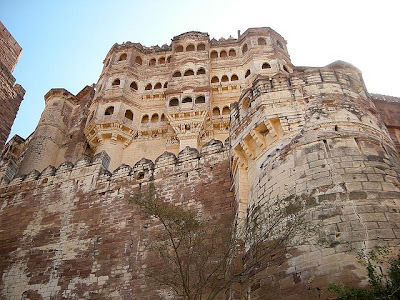 The massive Mehrangarh Fort is located in Jodhpur city, the second largest city of Rajasthan. It is one of the largest forts in Indian and known for its giant magnificent architecture. Jayapol is the mean from victory, Jayapol was built by Maharaja Man Singh and it is most popular in top seven gates, it is commemorate his victories over Jaipur and Bikaner armies. Fattehpol (also meaning 'victory') gate was built by Maharaja Ajit Singh to mark the defeat of the Mughals. The palm imprints upon these still attract much attention even today. Mehrangarh fort museum is one of the well-stocked museums in Rajasthan. There are many brilliantly crafted and decorate palaces within the fort complex. The most important attractions inside the fort complex include Moti Mahal (Pearl Palace), Phool Mahal (Palace of Flowers), Sheesh Mahal (Mirror Palace), Chamunda Mataji, Temple, etc. 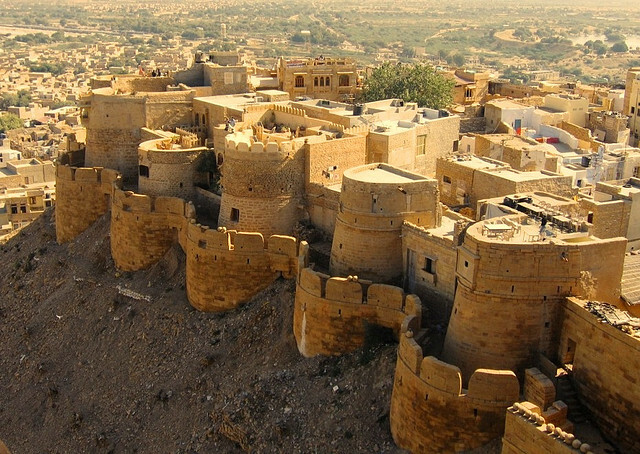 Golden Fort is situated at Jaisalmer City in Rajasthan and it was built in 1156 AD by the Bhati Rajput ruler Rawal Jaisal. The Golden Fort is also famed as a Sonar Kila or Jaisalmer Durg is one of the top most visited destinations place on during Rajasthan tours. Its massive yellow sandstone walls are a yellowish-brown color during the day, vanishing to honey-gold as the sun sets, thereby camouflaging the fort in the yellow sand. That's why it is called as the "Golden Fort". 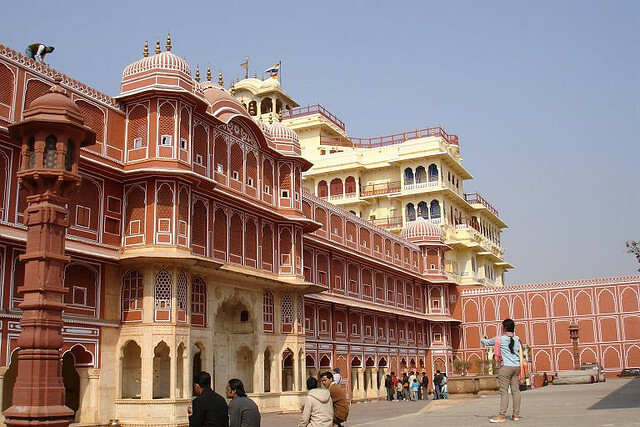 City Palace is a wonderful complex located in Jaipur, the capital city of Rajasthan. 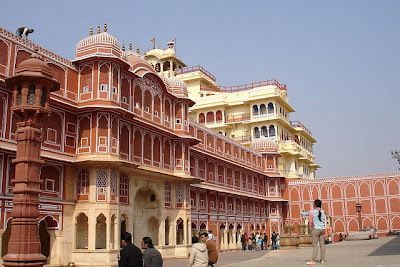 City Palace complex of Jaipur is a showed the mark able work of Rajput architecture. This exclusive and superb palace complex houses many beautiful structures. A major part of the 'City Palace' now consists of the 'Maharaja Sawai Man Singh II Museum'. It is also the abode of the Jaipur Royal Family. Chandra Mahal and Mubarak Mahal palaces are the major attraction of city palace complex. Rajasthan Packages. Simple theme. Powered by Blogger.